1) Breaking your fast with fresh coconut water! So refreshing! 2) Lie ins. Even if they only last for half an hour, it is the most treasured half an hour of the day! 3) Air Conditioning. It would be impossible to survive the summer without this genius invention in the sweltering heat of Dubai. 4) When the little brother is able to entertain Baby Z whilst I get the house chores or cooking done. 5) Biting into my McArabia! Undoubtedly my favourite pick from the McDonald’s Arabia menu. 6) Dark henna stains. The anticipation of knowing whether the stain is going to be dark enough is grueling. 7) The aroma of freshly baked goods. Need I say more? 8) Spending quality time with my little brother, sharing our little inside jokes and quibbling about the tiniest of things! 9) That first night after beginning Night Weaning when Baby Z sleeps without a single tear, and within five minutes! Hallelujah! 10) Seeing Baby Z finish his meals and knowing he is satisfied. Proud mummy moment! 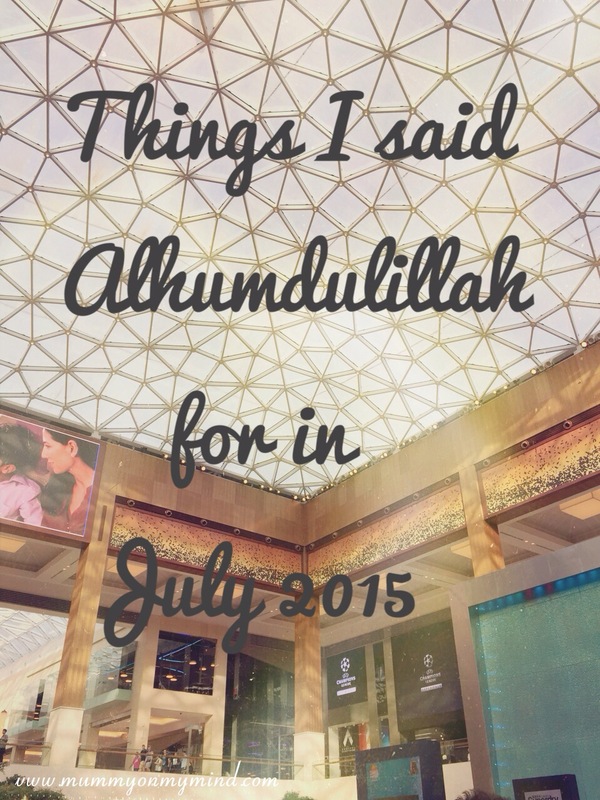 These are just ten of the many times I uttered the words Alhumdulillah this month. Check out what I was thankful for last month here. What are you thankful for? Feel free to share your moments in the comments section below!